WASHINGTON, Jan. 20, 2017 — America’s military has a new commander in chief as Donald J. Trump took the oath of office today as the 45th president of the United States. Thousands of U.S. military members from all service branches are participating in inaugural events. Military participants include bands, the salute gun platoon and escorts for all the dignitaries on the dais on the west front of the U.S. Capitol. Trump said that every decision that he makes as president will be made with America’s interests having the highest priority. “Every decision on trade, on taxes, on immigration, on foreign affairs, will be made to benefit American workers and American families,” he said. The new White House website does address some of the president’s military priorities. It says the United States cannot allow any nation to surpass its military might, and vowed to provide the required resources for future military capabilities and to bring readiness to where it needs to be. The preeminence of the United States is “at the bedrock” of the Trump administration, the president said in his address. 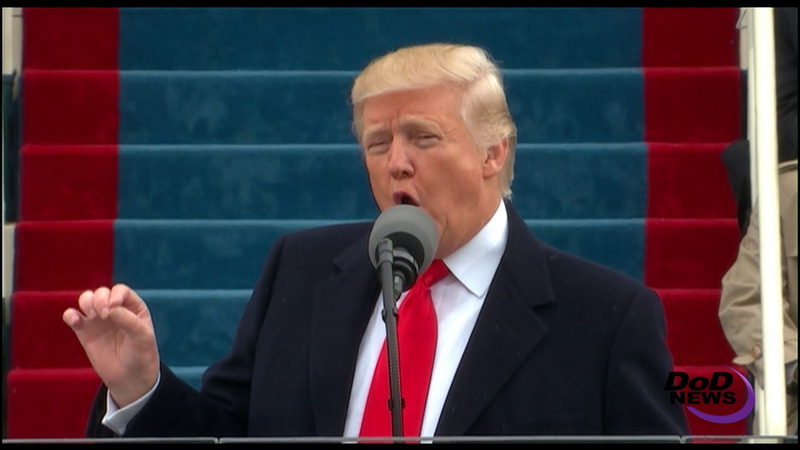 After taking the oath of office, President Donald J. Trump describes his plans to rebuild the United States during his inaugural address to the nation at the U.S. Capitol, Jan. 20, 2017.